This past Thursday I did the dog and doggie show, a keynote for the CATS 2010 Online Conference (CATS = Community of Academic Technology Staff for the California State University system). This was a reincarnation of one I first did for Faculty Academy in 2007, and on the Australia 2007 tour. This time I took a few stabs at the myth of Information overload, calling on the great Shirky spirit of pointing to filter failure. How do we deal with the never ending onslaught of new technologies, resources, and media? How can we face this brave new world without a sense of dread? Is there an app for that? “Keeping up” is a myth, and the way of dealing with this is creating, sustaining, and being in your extended networks of friends, colleagues, and even people you don’t know. Likewise, one cannot readily assess the value of new technology from the outside “looking in.” This presentation will lead you through a range of examples of ways to practice more “being there-ness” so you can face the technology fire hose with a child-like sense of wonder. I’m almost embarrassed to admit this was the first time I had done on in Keynote, and I am kicking myself for not having opened it long ago. It has such elegant templates, especially for images (I love the drag and drop), and it honestly just looks like it was created in the current century. I anticipate it will be only under duress that I will use Power(less)Point(less). 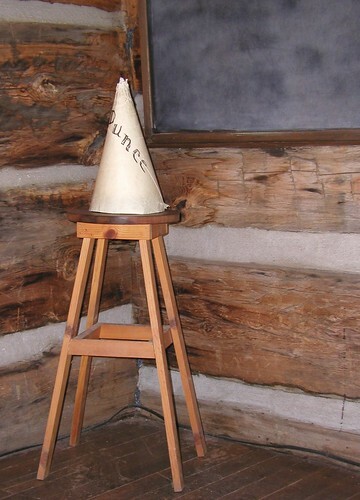 Can you believe that 100 years ago, an accepted and “sound” educational strategy was sitting a child in a corner wearing a dunce cap? Of course it is ridiculous looking back, but… what are we doing right now that in the future, some presenter might pull up a photo and say, “can you believe _________ was an acceptable instructional strategy in 2010 (ha-ha-ha-ha goes the future audience). Twitter still makes the perfect case for the thing I call “looking in from the outside” when we make some quick judgments about something we don’t understand or “get” — There’s not many who’s first reaction was mine when twitter was explained, “That’s the stupidest thing I ever heard of” (followed by “who cares what I had for lunch”?). It’s not a surprising reaction, and in some/many cases it might be accurate; I just wanted to make a case that it helps to recognize when that reaction happens, and if possible, question it. My example was in looking at the tools 50+ Web 2.0 Ways to Tell a Story, this was my reaction when I saw Blabberize (luckily, the talking alpaca is on the front of the site), but I eventually came across worthy ways that other people used something I almost dismissed because of that first brain-jerk reaction. The newer parts were a fast skim through a range of info filter tools I use, the obvious RSS Reader, but also Google Alerts, Google Custom Search, WolframAlpha, ReadTwit, and the guy who follows 15,000 people on twitter. But I added that people are almost more important filters than tools, and that the key in my mind, was identifying who the filter mavens were in the area that interests you. Alec Couros is a mega filter on twitter not just for sharingf relevant edtech links, but also social commentary, and lots of humor. But mostly, he is a huge convenet, getting large numbers to rally around cause or to try a new tool. I stumbled across Judy O’Connell’s blog a few years ago, and I remember getting a string of 5 posts in a row that had valuable web tools– my advice is to always have at least one librarian in your circle! Larry Ferlazzo is prolific on his blog with his “best of” lists; I did not count, but I believe him when he says he has over 8000 links. I got about one third of my 50+ Ways tool from Larry! I could list a few hundred more, but the point was to (try and) show that you slay the mythical InfoOverload ogre by filtering the people who are already filtering. Don;t ever discount the value and power of serendipity. 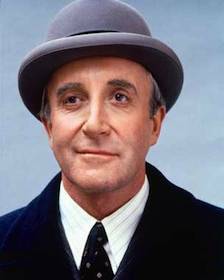 I don’t know exactly how to teach what is accidental, but there is something about “being there” in the flow, and curiously clicking a link, or exploring who other people follow, or reading a blog in a subject far afield. I did want to add a valuable reflection after getting a nice email from Todd, who is not far down the road in Prescott. He is obviously a major fan of the Peter Sellers movie, and he rightfully called me on not really pulling the metaphor all the way through. It is a little tricky, since Chance the Gardner is such an engima – either a simple idiot or a genius with an age old wisdom. And trying to connect him to Web 2.0 (do we still use that term?) is not exactly on, since Chance really fails at using the tools of the world he is cast out into (as Todd noted, out of place walking down the center of the median of a busy street). My take was that it is good to take the wide open, lacking judgement, simple view of the world that made Chance seem like such an attractive persona to those he came across who were laden with judgement and “reality”. How often when presented something novel do we jump to say “that won’t work” or “we tried that in 2006 and it failed) because it is outside the range of normalcy? Thanks again to Abbe at CATS for inviting me and Lou for being my Elluminiate co-pilot. It came across at the end that I was guilty again of wielding the firehose (and I thought I was subdued!). Now I also have a closing thought on webinars– these days you cannot sneeze without hitting one, which is not a bad thing. They make sense with budget cuts and heavy schedules. But the obvious hit me in presenting that with a virtual audience behind a conference tool, you really get the barest minimum of feedback during a talk. In person, you can read body language, watch people snoozing or bolting for the door or reading email, but its hard to gauge your audience, when at best you have a little box of chat. And I have no patience for those webinars that only provide the audience a moderated Q&A pod to communicate with- that is a system to stifle the audience from participating, yes, but it also blocks the presenter from the smallest eye into the audience. What also struck home was how stilted the usual mode of presentation is, of talking over slides. This is the dead horse beaten department, but, a session of my voice timed to slides is exactly what you see above, a slidecast. I want to contemplate something different in a webinar, where we actually do something, not one of us talking about doing something; I’ve seen Dave Cormier do the free form audience participating thing and a splendid participatory oen by Nancy White on drawing. There has to a batter way of communicating than talking over slides. I am dogged determined, but clacking a solid idea how to do it differently. The problem with presentation is that the keynote model– in fact, any model in which there are too many people to have a productive conversation– is fatally flawed. Because that’s what’s needed– good old fashioned, think-on-your-feet, conversations.